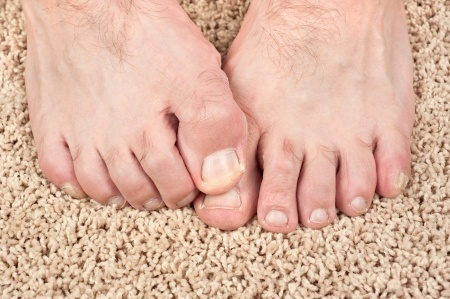 Toenail fungal infections may be more likely to occur in the hotter months, but these microorganisms are hearty and can easily survive in the warm, moist environment of your socks and shoes at any time of the year. There are now more advanced therapies available to treat difficult toenail fungus infections, but obviously the best way to handle this infection is to minimize contact with the microbes so you don’t get the infection in the first place. Correct toenail trimming technique—Always trim your toenails straight across to prevent the occurrence of ingrown toenails. Fungal nail infections often begin with a cut or wound near your nail. Air out your shoes and feet every day—Always be careful to wear socks and footwear made of breathable fabrics to help wick away moisture. Let your shoes dry out between wearings. Avoid cross contamination—Don’t wear other people’s shoes or use other people’s personal care products. Items such as nail files and clippers can harbor germs and spread infections, so don’t share these types of products to avoid spreading germs. Protect your feet—Whenever frequenting public areas such as gyms, showers, locker rooms, and public swimming pools, always wear sandals or shower shoes to keep your feet from directly contacting infected surfaces. Ensure your salon is using proper sterilization—Make sure that your nail salon has proper sterilization procedures to avoid spreading microbes. Medications—A wide variety of powders, lotions, and sprays are available to put in your shoes or directly on your feet. These will help to kill the fungal spores that lead to toenail infections. If you are having difficulties with a tough nail fungus infection, see your foot doctor for the proper treatment. At E.J. Nemet Podiatry in Twinsburg, E.J. Nemet, DPM, treats a variety of foot and ankle conditions, including sports injuries, pediatric foot problems, diabetic foot complications, nerve disorders, and toenail and skin conditions. With advanced technologies and a dedicated staff, Dr. Nemet provides expert and compassionate care to patients in the Twinsburg and Beachwood areas. To contact us or to schedule an appointment, please call (234) 212-9940.